To truly explore new and innovative possibilities, a flexible print order is required. It is essential to be able to interleave digital and traditional technologies. The Graphium system enables this by allowing the Xaar digital print bar to reside anywhere on Graphium’s rail system. Digital printing can then be added at any position on the web, whether it be in front of the main print engine or as a post print process. Graphium can then route the web in different ways in order to interleave the print bar in between flexos. The Xaar digital print bar, allows mono inkjet printing using white, black and clear UV inks and can be tuned by print head selection for resolution, speed and ink lay down. The Graphium hybrid digital inkjet label press combined with the Xaar digital print bar, enables both pre-print and post-print digital finishing and embellishments to be achieved in a single pass. 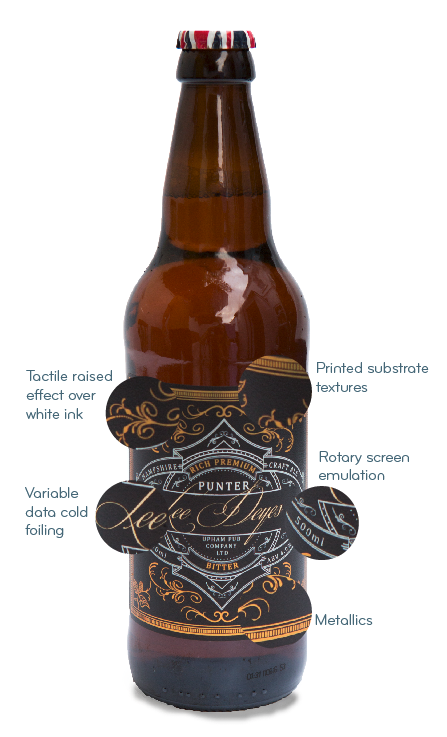 Back printing reduces the typographic content on a label face side thus maximising the look and feel of the brand. To achieve this digitally, use a black or white print bar or flexo, mounted before the main digital unit with a turn bar. For self-adhesive stock, a delam/relam unit can allow glue side printing. Graphium’s digital inkjet white is now capable of running at the same speed and with the same opacity and ink order positions as rotary screen, yet still provides resolution capable of the finest details at the same time. A true replacement technology, which completely eliminates the setup cost and setup time of screen. Clear and white inks can be used in Graphium’s large drop grayscale heads to create tactile effects. The advantage of using white ink to create textures is that it can be used in combination with digital CMYK printing and varnishes allowing anything from matt to high gloss to be consistently achieved. Bump maps can be used to achieve modelling off the inks topography. This allows the emulation of a micro embossed paper, like a wine stock, using a lower cost non-converted paper. Flood varnish – careful selection of flood varnish allows the matt effect to be retained like a primed media. This also overcomes printability issues of UV ink with highly absorbent uncoated media. Substrate emulation can also incorporate colour similar to a proofing solution. The biggest benefit is that the combination of ink and substrate can be less than sourcing bespoke or specialised media. Tactile effects – using clear inks allows the tactile effect to provide a contrast in reflectance from matt to gloss. 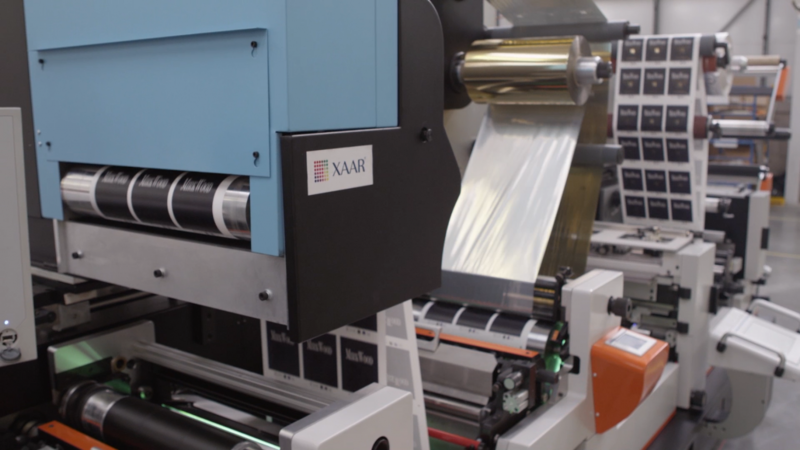 With the Xaar print bar positioned next to Graphium’s lamination module the print bar varnish also acts as an effective cold foil adhesive. Controlling the ink density digitally in combination with LED pinning allows a vastly improved tear off and adhesion compared to traditional cold foil. UV inkjet cold foil in terms of edge quality. When this is used in combination with a secondary clear ink even hot foil type embossed effects are achievable in shorter print runs. New applications – now cold foil is achievable digitally at high speeds it is possible to combine the security features of holograms with variable data for totally new and unique applications.